Nora Patey knew what she wanted when she went car shopping over Presidents Day weekend: a small SUV, with a backup camera, high carriage and a reasonable monthly lease payment. Even so, many of the salesmen made their pitches to her boyfriend. "He would have to say, 'It's not my car, don't talk to me, talk to her,'" the 24-year-old recalled. "Even though I would initiate the introduction and say that I was looking for the car, and I was buying it, a lot of the conversation would frequently get directed to him." Like Patey, who eventually bought a 2016 Mazda CX-5, a growing number of women are shifting the gender demographics of vehicle sales and challenging automakers' long-held assumptions about who drives their cars. In particular, single women are buying more SUVs, fueling a surge in demand that has 2016 on pace to top last year's record 17.5 million light-vehicle sales in the U.S.
From 2010 to 2015, mainstream small SUV sales to women rose 34 percent, compared to a 22 percent rise for men, according to MaritzCX, a customer-experience software and research company. 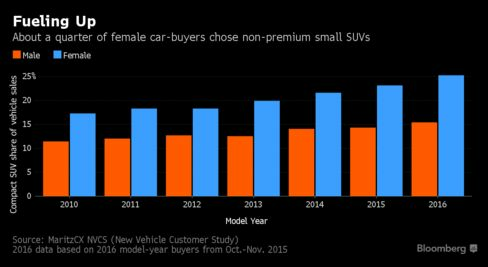 In the same period, premium small SUVs, though smaller in raw numbers, saw 177 percent growth in sales to women. And among female carbuyers overall, a full 40 percent aren't married. "There's a group of single, professional females out there that need vehicles, and you need to be attentive to them," said James Mulcrone, director of research services in MaritzCX's Michigan office, who has studied trends among female car buyers. "They're going to make money, they're going to make their own decisions, and they can be very loyal consumers." Increasing income and education as well as a general delay in marriage and child-bearing combine to create a growing number of single women buying cars, Mulcrone said. More than two-thirds of female buyers reported their 2015 purchase decision as "entirely up to me," and the appeal of SUVs, with ample cargo room and improving fuel economy, is widespread. Those trends are compelling to automakers, whose SUVs and other light trucks are outstripping sedan and coupe sales even as May deliveries announced Wednesday are projected to decline for all of the largest names, attributable to having one fewer weekend compared with last May, according to a Bloomberg survey. On average, analysts see the annualized selling rate, adjusted for seasonal trends, slipping to 17.4 million amid concern that demand is waning. As they roll into the summer sales season, automakers tend to bank on Memorial Day weekend for a sizable portion of the month's business. "It's too soon to say for sure that auto sales are leveling off," said Jessica Caldwell, director of industry analysis at Edmunds.com, in a note with estimates. "The summer months will flush out more incentives from automakers and the urgency that shoppers show in responding to these incentives will give the industry a much better sense of how the market is trending." After a 14 percent sales decline seen for Volkswagen AG's VW and Audi brands, General Motors Co. will suffer the steepest drop among the largest automakers, 13 percent, analysts estimate, as it reduces deliveries to rental fleets and caters more to retail consumers. Toyota Motor Corp. is expected to sell 8 percent fewer vehicles amid supply-related disruptions from recent earthquakes, along with a 6.1 percent decline for combined sales from Hyundai Motor Co. and Kia Motors Corp. Fiat Chrysler Automobiles NV is projected to report a small drop, its first in more than six years. One way to woo women like Patey is to put more women on the other side of the counter as well, says Celeste Briggs, director of the Women's Retail Network at GM. "Dealerships that welcome and invest in women have the opportunity to create a strategic advantage," she says on the website for the initiative. About 60 percent of women who leave a dealership without buying never return, according to Women-Drivers.com, a car-dealer review service. What's more, Briggs says, women tend to be loyal customers. "If you treat her right, she'll stay," said Briggs in a telephone interview. "And she'll also tell a few friends."